Table Rock Lake is one of the best fishing destinations in the Tri-lakes area in the Ozarks that provides you unparalleled fishing and fascinating Branson outdoors. Whether you are a seasoned angler or just starting to learn fishing, you will definitely love to fish in the lakes of Branson. While Table Rock Lake offers an abundance of bass, crappie, white bass, catfish, and bluegill, it is acclaimed as one of the best bass fishing lakes in the country. The lake has a reputation of producing hefty stringers of bass laced with lunkers and it earned through an unprecedented management program. A limit of a 15-inch length and a creel limit of six fish linked with an abundant food chain at Table Rock Lake is the foundation of the program. This resulted to a large numbers of largemouth, Kentucky and smallmouth bass of exceptional size available anytime of the year for novice and professional anglers alike. Table Rock Lake contains several species of game and pan fishing that include dominating fish such as Largemouth, Smallmouth and Spotted Bass, White Crappie, Bluegill and Long Ear sunfish. Secondary species include White Bass and Black Crappie while Walleye, Warmouth, Striped Bass are considered limited species. During spring season, as the water rises and warms the fish in Table Rock Lake, these species become more active moving into shallow areas seeking spawning locations. Smallmouth and Spotted Bass will be in the clearer water from the mid lake to the dam and can be found holding on rock cover 15 feet deep or deeper. The popular baits to use include suspending jerkbaits like Smithwick Rouges or Lucky Craft Pointers, White War Eagle spinnerbaits, tight wiggling crankbaits like a Storm Wiggle Wart and a small jig and craw combos such as a Jewel Eakins’ Jig and Craw. Once the fish have completed the spawning they will move out of spawning areas and suspend on points, bluff ends and drop offs feeding on abundant threadfin shad, topwater baits like a Heddon Spook or Lucky Craft Sammy which are very effective early or late in the day. Small buzzbaits, floating worms and Yamamoto Senko are all productive post-pawn baits on Table Rock Lake. During summer, most of the fishing on the lower end of Table Rock Lake takes place well off shore. 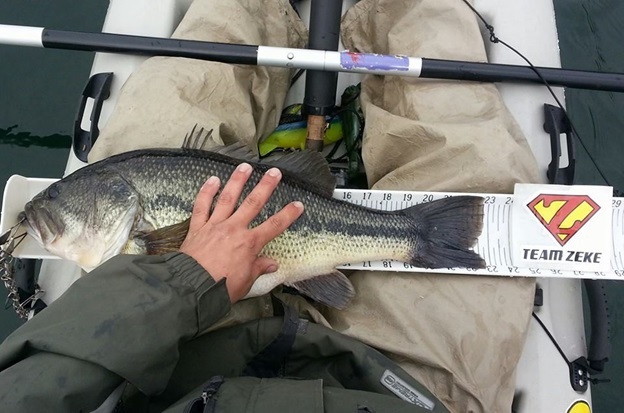 Spotted bass can easily be caught on spoons, drop shot rigs and ¾ oz Jewel football jigs. The fish is generally found holding on the sides of deep points from 30’ – 70’ deep. With the use of quality sonar units, anglers can easily locate schools of spotted bass and drop baits directly in the school to trigger strikes. While you feel it’s pretty easy to catch, Smallmouth become pretty tight lipped in the heat of summer, most are caught on the bottom with shaky head worms, Jewel spider jigs, or Chompers’ spider grubs. So, if you are looking for the best place to catch bass, head on to Table Rock Lake and cast your rods and enjoy Branson outdoors.